Bask in the glory of a sun kissed glow. With Turmeric, known to give you radiant skin and Tonka that cloaks you with sweet spicy hints of vanilla, our body wash is like a ray of light for your skin. 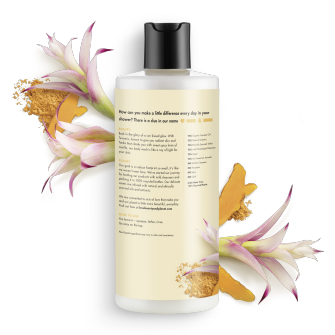 This body wash is also cruelty-free, paraben-free, silicone-free, dye-free, sulfate-free, and formulated without phthalates. 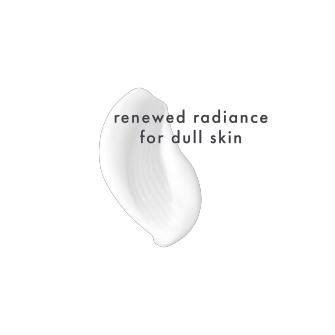 Who doesn’t want radiant skin? Start the day with the uplifting scent of Turmeric and Tonka Essence. Talk about showering your skin with a gorgeous sun-kissed glow! While Turmeric is known for promoting healthy-looking, glowy skin, Tonka Essence cloaks skin with irresistibly sweet and spicy hints of Vanilla. Breathe deep. Take a moment. Enjoy the feeling of being transported to your very own slice of paradise. More than a moisturizing body wash, this is a body wash to escape with. • Squeeze shower gel into hands, lather on body, rinse off. Oh, and don’t forget to keep your showers short. Our unique Body Wash formula cleanses your skin and leaves it feeling soft and nourished, with every wash.
turmeric & tonka essence body wash is rated 4.6 out of 5 by 153. 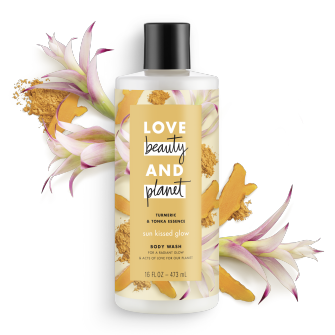 Rated 5 out of 5 by megans19 from I love love love the Love Beauty and Planet Turmeric & Tonka Essence Body Wash! I read other reviews that said it didnt lather well and I have to disagree. It lathered great. Smells absolutely divine. Delicious even. And its thick, so a little goes a long way, which makes the price and bit easier to deal with. It is a bit pricey, but you get what you pay for! As long as you dont share your bathroom with a toddler who likes to squeeze all your body wash in their bath, this is so worth the $$! I will buy it again and I will recommend to friends and family alike!! Thanks Influenster for the great product and the opportunity to try it out! Rated 4 out of 5 by bethi55a8 from So for starters I love how big the bottle was and how it seemed the company took pride in what was in the soap from the outside label. I like how it stated which ingredients are not included such as parabens which is important to me. The smell was pleasant and I did like it. Though soap though was a little average. It cleaned, did its job. I didnt feel a lot of moisturizer which is what I need but I will still continue to use the soap while alternating with another one. I do like it though and would consider buying the same brand again but maybe something more suited towards my needs. It did not leave me extra dry, I just prefer more moisturizer. Rated 5 out of 5 by mercedesva0ff from I'm super happy I got chosen to try Love Beauty And Planet Body Wash. I love there shampoo and conditioners so much I can't believe I've never ran in to any of there body washes before this. I had no problems with this body washes at all. I love the smell, the feel, and the lather. One thing I did notice this was that the lather on a wash cloth vs. A sponge was totally different. So if you like very little lather use a wash cloth but if you like a lot use a sponge which is how I use it. I've recommended this brand many times and will keep doing so. I got this free to try from influenser in return for my honest opinion of it. Rated 4 out of 5 by katherinema121 from I have liked every Love Beauty And Planet product I have used this far and this was no exception. This body wash lathers nicely and leaves my skin feeling soft and clean. I like that it is dye free and packaged in recycled bottles. I tend to pick more fruity scents myself, so I found this a little earthy for my liking. Though, it doesn't leave me smelling earthy and my husband likes the scent. I am looking forward to seeing how it affects my skin with more uses and would certainly will not hesitate to try a different scent in the future. I received Love Beauty And Planet Turmeric & Tonka Essence Body Wash complimentary for testing purposes from Influenster. Rated 5 out of 5 by Anonymous from I finally got my first VoxBox. I got a Love Beauty And Planet Turmeric Tonka Essence Body Wash. The thing that caught my attention at first was the pretty label, so cute. I didnt know what was Tonka Essence, so I decided to give it a try. Omg! The smell is incredible, I loved it! I took a shower and let me tell you, this product is soooo good. I have a very very sensitive skin so I cant use whatever beauty products, I always check for specific ingredients. And this body was has the perfect combination. Its vegan, cruelty free, organic, its amazing! And my skin is soft, with no irritation and with an incredible fragrance. I highly recommend this, you wont regret it.